A well-defined contractor management process is essential for mitigating risk and ensuring quality in the work performed by contractors for your business. Here are 6 ways that you can improve your Contractor Management Process. A standardised pre-qualification process simplifies acquisition and provides a consistent way to assess suitable contractors for delivery of services. One way to streamline this step is to “Make it the contractor's obligation to provide the right information for applications”. What do we mean? Forcing the contractor to complete pre-qualification forms and ensuring they have adequate documentation before submitting an application will reduce the burden on your staff during the approval stage. Whether they submit the application via email or an online software system, making it the contractor's obligation to supply the right information will speed up the process for you. Software systems provide many advantages if you are managing a large volume of applications. Electronic form submission processes can help vet contractors who do not meet requirements by preventing the submission of an application until all necessary information has been provided. Well-built software solutions may also allow you to automate parts of the on-boarding process as well as ongoing management and scheduling the expiration of the suppliers - again reducing the burden on your staff. An organised contractor database is vital for ensuring quality and compliance standards are maintained. Pre-qualification status, hazardous work qualifications, permit expiration and contract expiration dates are just a few of the basic items you will need to keep on top of. A database can be managed on a spreadsheet or via a software system. Either way, ensure you maintain a centralised repository of all contractor information. Using a single source of truth makes finding an approved contractor and their details much simpler. As your database grows, so will the need to provide access for multiple managers. At some point, you may find benefit moving away from a spreadsheet to an automated software solution. For the larger databases that require a software system to manage, you will find added bonuses which may include the ability to show all pre-qualification applications, certification validity, contact information and work history. Providing access for contractors to view and modify their own data will streamline the workflow in your company processes. Allowing sub-contractors to update their own information, submit applications and upload associated documentation removes additional administration by your own staff. An online web-portal, for example, that updates in real time may allow your business to feed out messages, updated documentation and send alerts to your contractors at the click of a button. Contractors attending your work sites should be properly inducted to ensure they understand the site requirements and any risks involved. Your induction system should integrate with your contractor management process and your contractor database. Whether updating data is a manual or automated step, it is required so your staff can process authorisations to work and permits to work. i.e. your staff should be able to look up a company, see they were approved as a contractor, have an active contract, have successfully completed their induction and are now ready to proceed to the final authorisation to work approval process. A software-based contractor management system (CMS) may assist by automatically updating your central database with induction information, avoiding the need to cross-reference multiple spreadsheets when assessing your contractors. An efficient permit to work & site access process is a vital component in your work site risk management strategy to ensure you meet security, safety and compliance obligations. Whether your business manages hundreds or thousands of contractors on your work sites, it is vital for your supervisors, duty managers and security to know who is authorised and permitted to be on site. Depending on your work site, you may need weekly or daily report updates for your site managers. If you find you have a lot of ad-hoc corrective maintenance work, the frequency may be even higher, requiring updates throughout the day. As a manual process, this may be time-consuming and you will need to rely heavily on a well organised, up to date database of information. It will be important you have the ability to produce clear reports for your site management staff or alternatively, provide them with access to your central database. Software solutions may provide you with the ability to share live data and display lists of authorised workers & visitors for your site managers. They also provide a simple way to track your site access history. Do your contractors have an easy method for reporting hazards and incidents? 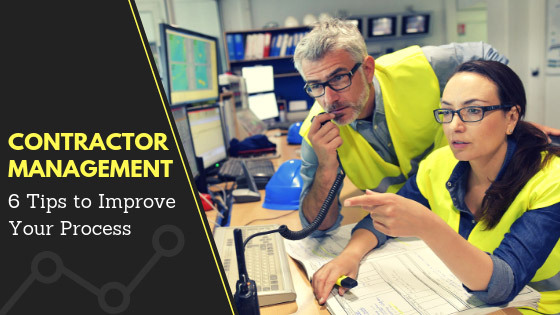 Giving external staff access to report issues is another excellent way to leverage off your sub-contractors and reduce the work required by your staff as well as improve safety on your work sites. Some of the options available that allow contractors to report issues are by phone, email, or online via an electronic form or mobile app. As you move towards the electronic software solutions, the effort required by your company reduces as software solutions provide many benefits like automated notifications, responses and workflow. Regardless of how contractors report issues, provide them with an array of ready to go forms (printed, pdf, electronic, etc.) that the contractor can submit.